This year is the centenary of Londoner of Note, Norman Parkinson (1913 – 1990), the tall, eccentric photographer with an aristocratic air and mischievous twinkle in his eye. And what an eye! Whether in black and white or colour, Parkinson mastered the medium with images which oozed class. Although he shot celebs in the second part of his career, first and foremost he was a fashion photographer; he gave mysterious, striking fashion models a uniquely cool allure. 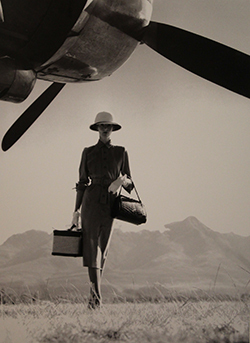 Parkinson’s best-known fashion picture is probably the one on the right, The Art of Travel, shot in Kenya for Vogue in 1951 and featuring his wife, Wenda, whom he used a lot in the late 40s and 1950s. To celebrate Parkinson’s centenary, there is a free show of about a hundred of his works at the Lyttleton Theatre, National Theatre. They are broadly representative of his early fashion work for Vogue, featuring rangy, elegant models though to the celeb beautiful people of the 60s, 70s and 80s, including the Queen in that famous triple portrait in blue with Princess Margaret and the Queen Mother. The Beatles, Burton and Taylor, Jagger and Hall, Bowie. And on and on. Most will be drawn to these I suspect, but I loved the mid century fashion stuff. Quite beautiful models and exquisite clothes: gorgeous women in designer tweed. And it is stunning. I don’t think you see that nowadays: couturiers have lost that. Not that I’m any expert in such matters. But you don’t have to be an expert to know your eyes are being treated to the work of a complete Master. Lifework: Norman Parkinson’s Century of Style runs at the Lyttleton Theatre Space at the National Theatre until 12 May. Free. Here are my favourite two images from the show. India. A goat, a peasant boat woman and a determined posh gal in designer daywear. Bizarre and beautiful. Three Little Dresses, 1961. 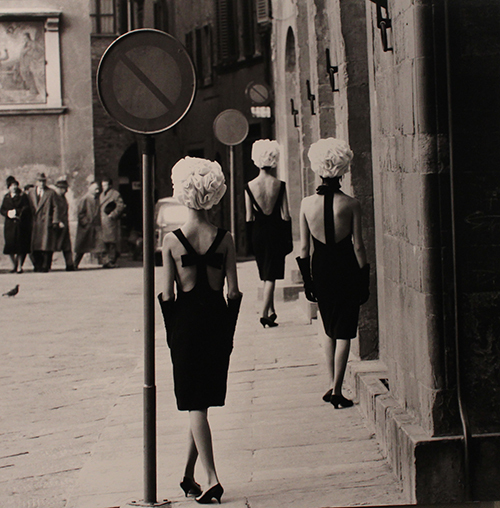 Shot in Florence, a masterclass in composition. Even the pigeon looks deliberate.